Three years ago this month, Boris Johnson pledged to end rough sleeping in London by 2012. Today, faced with a perfect storm of unemployment, funding cuts, welfare reform and housing market failure, even more people are sleeping rough on London’s streets. 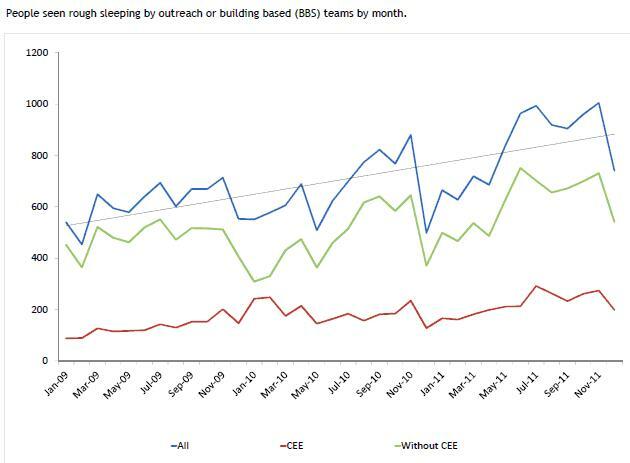 In September it was reported that rough sleeping between July-Sep 2011 was up by 34% on the same time the year before, while figures published in December (below) by CHAIN, the most authoritative source of rough sleeping data, show this increase continuing. The Mayor cannot escape blame for the increase in rough sleeping. He backs the government’s cuts to local authority and housing budgets, supports their poverty inducing welfare reforms and says inflation-busting rents in the private sector are not something he worries about. The Mayor’s has frozen his own rough sleeping budget at £8.5 million over the next three years. This is despite housing charities being united in its belief that the number of people sleeping on the street will continue to rise as the impact of government spending decisions and welfare reforms bite. A budget that cannot move to reflect changing and worsening circumstances is clearly inadequate. More worryingly, the amount of money given to the Mayor was calculated before the launch of his No Second Night Out programme in April 2011 on estimates of future need. By July 2011, it was already known that future need had been underestimated and that the budget was inadequate. Yet the Mayor’s budget has not changed. The situation has been exacerbated by the government not only cutting the Supporting People budget by 11% but also lifting the ring-fence that guaranteed it was spent on helping vulnerable groups like rough sleepers. This means that local authorities – facing across the board cuts – have impossible choices to make; use the money to preserve homelessness services or plug the gap in children’s services. So local authorities will be increasingly incapable of funding the services needed to give rough sleepers the help they need to turn their lives around. This is disastrous. The most recent CHAIN statistics show that of London’s hostel population 52 per cent require help with alcohol addiction, 35 per cent with drug addiction and 46 per cent suffer from mental health problems. The Mayor and his Government needs to understand that solving this problem requires investment – investment in homes, services and jobs. This is one of the wealthiest cities on earth. In times of austerity, the way we treat our most vulnerable and marginalised people will be seen as the barometer of how civilised we are as a society. Nicky Gavron is a London-wide London Assembly Member and Labour Group Spokesperson for Planning and Housing. This entry was posted in Uncategorized and tagged boris Johnson, CHAIN, homelessness, housing, London, London Assembly, Mayor of London, Nicky Gavron, rough sleeping. Bookmark the permalink. Nicky why is it that you censor comments? I notice that a comment of mine on an earlier piece seemed to be rejected by you or one of your underlings. Is it that you have a problem with those who disagree with your views on things? Let me explain how these things work – you put forward a supposition or opinion and publish that idea so that others are able to either agree or criticize the idea you put forward. I notice that there is a dearth of comments in the comment section of your blog. Do you spend time talking to yourself or are your assistants protecting you from the horrors of those who take a contrary view to yours? Very sorry that I failed to approve one of your earlier comments. That must have been down to administrative error. This website is in no way censored. All comments are welcome and, like you, I hope to see more in future.